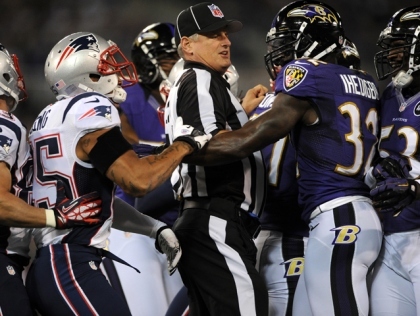 I caught a little bit of the Patriots – Ravens game tonight. The unnecessary shoving and slapping I witnessed in such a short time may actually rival that of the Jersey Shore crew. However, these football players didn’t require absurd amounts of alcohol to get hype… JUST replacement refs. I agree, the officiating has been just plain bad, and wildly inconsistent. The delays, poor calls, missed calls, and flat-out confusion that has occurred since the replacement refs were handed the reigns is frustrating. Clearly, “frustrating” is understatement for what it’s been for players and coaches. However, I’m pretty sure of one thing: there’s no excuse for the fighting and/or harassing and demeaning of these officials. As I watched the game unfold, I couldn’t help but notice the mounting horror on the faces of these poor blokes. They are, after all, in charge of keeping order amongst very large men who have now resorted to physical violence against one another. Not good. Then it struck me. I’ve dealt with this before. This is what I like to call, Substitute Hysteria. If you’ve ever had a substitute teacher, you know exactly what I’m talking about. Remember that stickler of a teacher you had, whose class you dreaded? Remember the joy you felt when you walked into his or her room and saw an unfamiliar face behind the desk? Yesssss, we’ve got a sub! Whether you were a good kid (like me ;)), or the one that made that substitute hate their life for a solid 50 minutes, you’ve experienced Substitute Hysteria. There is a certain sort of madness or frenzy that can occur when a group of kids outnumber a naive and unsuspecting substitute teacher. Spit wads, slapping people (friends or enemies), and other random acts of craziness occur. Most of which would never happen if the “real” teacher was in. 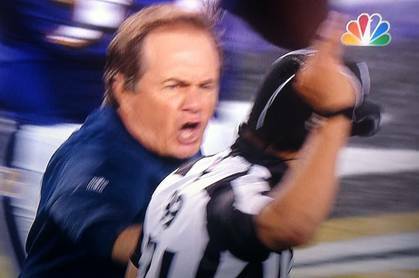 That same hysteria has taken over what used to be an orderly classroom, headed by Ed Hochuli and his biceps. 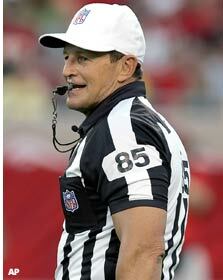 Unfortunately, Mr. Hochuli & Co will be absent for at least two more weeks even if a deal to end the lockout is reached soon. Meanwhile, these poor subs have completely lost control of their classroom. Now it only takes a few bad “kids” to evoke madness in a classroom. Likewise, there are always a few unruly parents as well. Parents who think they know better than the teacher and think they can call the shots, rather than teaching their kids to be respectful. 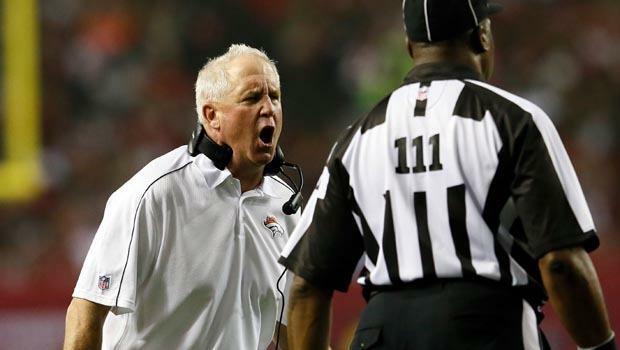 I mention this because there are now two coaches, Denver Broncos head coach John Fox and defensive coordinator Jack Del Rio, who are reportedly being fined $20,000 each for publicly criticizing the replacement refs. Then there is Bill Belichick, who made the not-so-smooth move of grabbing a replacement official by the arm while running off the field tonight. Get your checkbook out, Bill. That’s gonna cost you, too. The point is, just like parents can make jerks out their kids, coaches can do the same to their players. OR, they can be like good mommies and daddies and teach their kids that despite the second-hand officiating they’ve had thus far, they must still carry themselves with class and act like role models. To wrap it up, I want to explain why I’ve been so empathetic to the replacements. I have been a substitute teacher. You do the best with what you’ve been given, and hope that your students aren’t heathens. For those that are heathens, a little dodgeball to the head during gym class will shut them up rather quickly, or so I’ve heard. Whoops! 😉 For the replacement officials, your little yellow flag (when used correctly) should help you maintain order as well. There are so many home-based consulting buenseisss out there if you want to sell a product. There’s Avon (catalog sales), Mary Kay (makeup), Pampered Chef (cooking utensils), Partylite (candles), Melaleuca (all natural, non-toxic household products), and Primerica (financial services and life insurance). If you are not looking to go home to home, consider offering another service. Website design has a huge demand and with products like Yahoo!’s Sitebuilder, it has never been easier to set up a website. You can also link your website to affiliate companies and make money for referring people to different websites. (Commission Junction is a great, free company that will help you set up affiliate accounts.) If you are familiar with bookkeeping, it is also a great business for working from home. And lastly, I highly recommend a copying business that delivers. You can buy a laser copier for about $ 125 (Brother is the best and is about $ 50 for used toner cartridges) then charge $ .05-.08 per copy. An Epson color copier is a good choice as well. It will give you photo quality pix and is only $ 5 per refill cartridge for less then $ 100 startup. If you offer to volunteer to deliver the products, people will definitely hire you. Merely slap a sign on your car with your phone number and website on it and people will begin to call you. Any other services people want (like binding, carstock, etc.) Office Depot can do for you for really cheap (although they usually take longer) and you can mark up the price a percentage. Hope this helps.